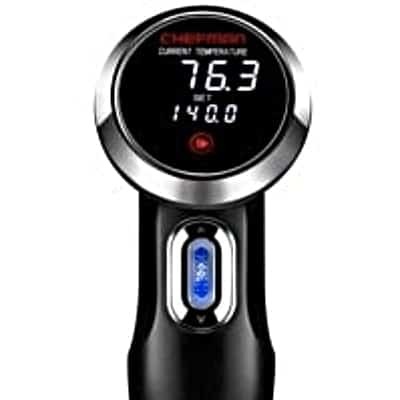 The Chefman Sous Vide is a great choice for the home chef who's interested in moderate usage. This is a better than average quality model, with most of the features you're going to be looking for. Higher than average flow rate 2.2 GPM. $72.03 Current Price - YOU SAVE $32.12. The Chefman Sous Vide Immersion Cooker is a great mid-level unit that's best suited for moderate use. It's high quality that has most features home chefs will want while leaving out the advanced functions to keep the costs down. As long as Bluetooth or WiFi connectivity isn't something you want, this is a solid choice. The Chefman Sous Vide was 16" tall, making it much taller than the average model we reviewed. The design had a larger flared top than most models, so it did feel a little top heavy. The unit had a heavy duty polycarbonate housing and a stainless steel tube encasing the heating element. It definitely felt solid, and the quality was higher than average. It featured an alligator style clamp for attaching itself to the side of the cooking vessel. Alligator style clamps are easier to set up and break down for cleanup, but they don't offer the flexibility to adjust the height of the unit, so it's always a trade-off. This model is rated for 1000 watts of power, which was average for all of the models we reviewed. It had a flow rate of 2.2 GPM which is higher than the average of 2.0 GPM. This model didn't heat up as fast as the Gourmia Sous Vide GSV138 but it was close behind only taking a few minutes longer. If you are planning any long cooking events, you are going to have to be mindful of your water level, as this model will have a faster evaporation rate. The control panel is fairly easy to understand and operate. The larger temp shows the current temperature of the water, the smaller temperature shows the set temperature. The temperature is adjusted up or down by a scrollwheel located on the front of the tube. The "play" button starts the unit up. There is no built in timer. We wouldn't consider this a negative as most on-board timers are challenging to work with. This model does not have Bluetooth or Wifi Connectivity and does not connect to an Amazon Alexa. DO NOT be confused by the Chefman Sous Vide app, it's an accompanying product it does not control or communicate with the sous vide in any way. The Chefman Sous Vide is a great starter unit that's best suited for moderate use. If you're a serious home chef, the Anova Bluetooth Sous Vide is a much better choice. 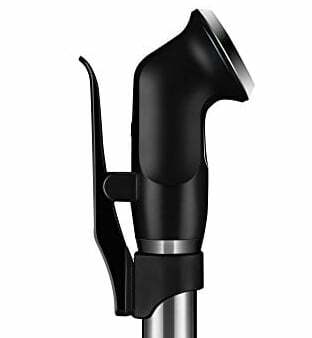 16" x 4" x 3" 11.1" x 14.8" x 4.5" 16" x 3.5" x 3.5"
The Chefman Sous Vide gets high marks for quality and ease of use, it is missing some of the higher end features and is best suited for a moderate home chef.